Besharah turned on the style to register back-to-back Pattern-level victories with an emphatic triumph in the Pinsent Masons Lowther Stakes at York. The well-supported 11-4 shot added to her win in the Princess Margaret Stakes at Ascot when demonstrating a rapid turn of foot to claim the Group Two prize. Settled in behind the keen-going pair of Easton Angel and highly-touted Newmarket maiden winner Lumiere, the William Haggas-trained two-year-old forced her way between them to hit the front just outside the furlong pole. Once in the clear, the daughter of Kodiac quickly put daylight between herself and her rivals, crossing the line two and a quarter lengths ahead of Lumiere under Pat Cosgrave, making it a quickfire double for Haggas after Tasleet in the opener. 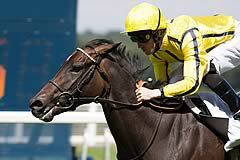 Coral cut Besharah from 25-1 to 14-1 co-favourite for next year's Qipco 1000 Guineas. Haggas said: "She hadn't shown at home that she'd been improving like that and the step up to six furlongs certainly helped her. "She won easily at Ascot but this was a much tougher race, so I'm surprised how easily she's done it. "Mark Johnston's horse (Lumiere) had only won a maiden, so we didn't know how good she was, but Easton Angel has been a pretty good guide all season. "We'll have to go for the Cheveley Park now. Hopefully we can keep her in the same form as now as it is some way off, but we managed it with Rosdhu Queen (won both races in 2012)." Cosgrave said: "Quite surprised, but I think she's getting better. It suited her going in the gaps and getting tight." Johnston said of Lumiere: "If you'd said to me two months ago she'd be second in the Lowther on just her second start I would have taken that. On her debut she never saw another horse, so she lacked experience for a race like this. "William (Buick) said she didn't quicken off the ground like she did at Newmarket. "I'm not downhearted at all. She was staying on again at the finish when she could have dropped away and if we went over further it would probably be at the Breeders' Cup rather than in England. "John (Ferguson) said to keep one eye on that (Breeders' Cup), it's a different ball game, but something we'll keep an eye on. That's one thing we can keep up our sleeve. "She's a six-furlong filly at the moment, but in relation to the other horses in the race she is probably the most scopey here and I'd be most surprised if she didn't stay a mile at three." Michael Dods said of third-placed Easton Angel: "On first impressions she'll be better off back over five. "We kept it simple today. She was last off the bridle and while I haven't spoken to Paul (Mulrennan) yet it looked like she was just outstayed."